For me, summer is practically synonymous with grilling. I love to grill for two reasons. One, it’s a super-quick way to cook lean proteins and guarantees flavorful, juicy results—without having to add a lot of fat or calories. And two: I get a break from cooking. Andy, my fiancé, does all the grilling. I just do the prep work—and this handy chart with marinating and grilling times makes that part easy. Unfortunately, there is a downside to firing up the grill. Cooking meat at the high temperatures (350°F and hotter) you use to grill—as well as broil and fry—creates compounds linked with some cancers, specifically heterocyclic amines (HCAs) and polycyclic aromatic hydrocarbons (PAHs). While some studies suggest that grilling produces compounds linked with cancer, there’s no evidence that grilling causes cancer. And the risks associated with eating grilled meats are relatively small when you look at the big picture. For example, if you’re 30 pounds overweight, that puts you at much greater risk for developing a number of cancers than does eating grilled meats. The bottom line? Keep your grill (you can bet that I [er…Andy] will continue to grill). But when you do fire it up, here are 4 easy ways you can reduce HCAs and PAHs. 1. Grill fish. Beef, pork and poultry tend to form more HCAs than seafood because of their higher amino acid content and longer grilling times. Start grilling with these healthy seafood recipes, menus and tips. 3. Flavor meats with marinades and rubs. (Try one of these easy mix-and-match rubs & marinades.) Research in the Journal of Agriculture and Food Chemistry showed that marinating red meat in beer or wine for two hours significantly reduced HCAs. Scientists believe the antioxidants in these marinades block HCAs from forming. Similarly, a Kansas State University study found that rubbing rosemary, an herb known for its high level of antioxidants, onto meats before grilling cut HCA levels by up to 100 percent. Herbs including basil, mint, sage and oregano may have similar effects. 4. Pair grilled meats with vegetables, particularly cruciferous ones. In one study, men who ate about 2 1/2 cups of Brussels sprouts every day for three weeks reduced their DNA damage significantly. Cruciferous vegetables, such as broccoli and cabbage, contain sulforaphane, a compound that may help the body clear DNA-damaging compounds more quickly. 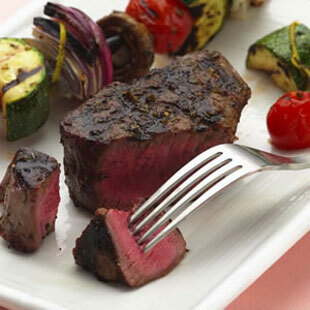 Try this: Grilled Filet Mignon with Vegetable Kebabs.